This is the blanket that I started back in April, and finally finished about a month ago. Did I mention that I’m slooooooow when it comes to making blankets? It also took me more time than usual to edit the pattern since there are color changes and a couple of different stitches involved. This blanket is by no means difficult, it’s actually super easy, but it just had a bit more counting of rows to get the striping right. It uses chunky, Cascade Yarns 128 Superwash Wool, which means it’s soft, washable and warm. This is one of my favorite stitch patterns (the granite stitch – I’ve also heard moss stitch or linen stitch) and you might recognize it from the Fave Slouch Beanie that I made last year. 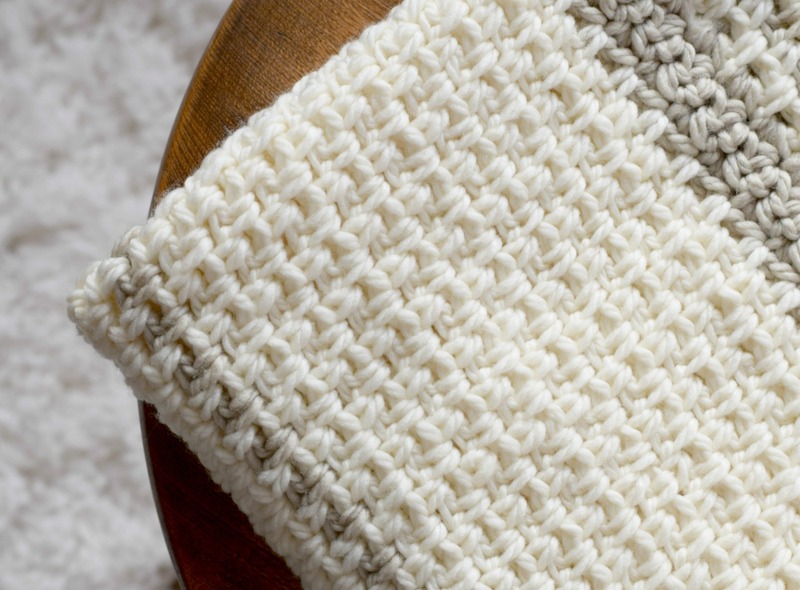 You can see a FULL TUTORIAL on how to make this simple stitch from Fiber Flux HERE! I’m so pleased with how this cozy blanket turned out and it’s new home is in the master bedroom! 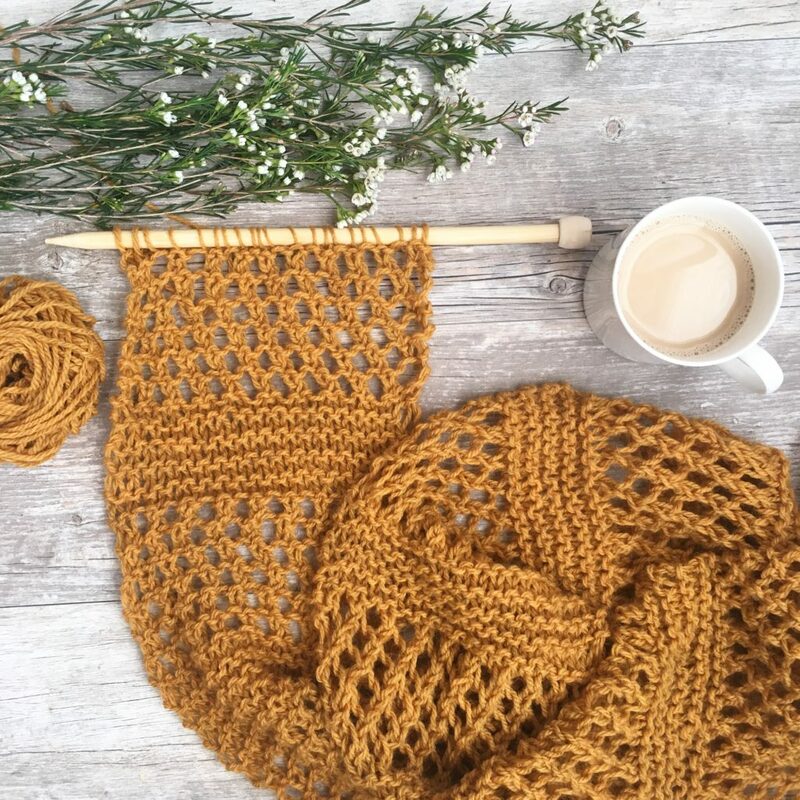 With all of the knit and crochet projects that I’ve made, I want a few pieces to be special enough (and modern enough) to keep around for a while…..like maybe until my daughter is grown. Have you made anything that you hope might be heirloom worthy? This afghan isn’t the cheapest project in the world, but every now and then I think we can justify a more expensive project. I’m hoping that this blanket will be used for many, many years. My daughter and I were so excited to see snow when we woke up in the morning! 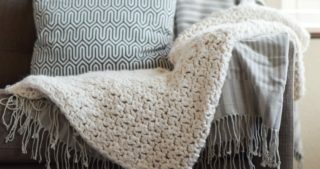 This blanket uses the granite stitch which gives it a woven look, but I wanted to make sure we knew it was crochet so I changed up the stitch for the thicker grey stripes. 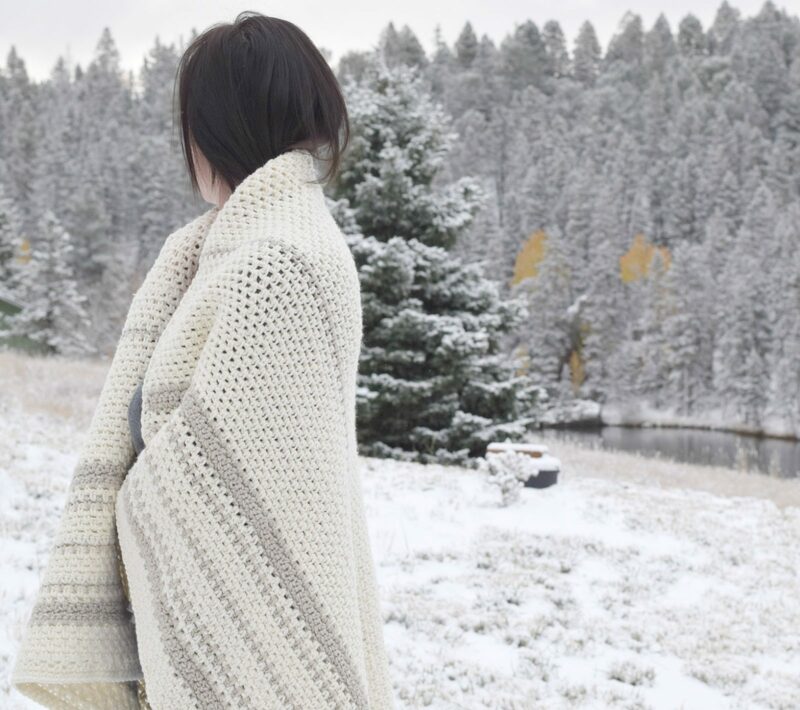 A neutral, modern, heirloom quality blanket made with super wash wool. 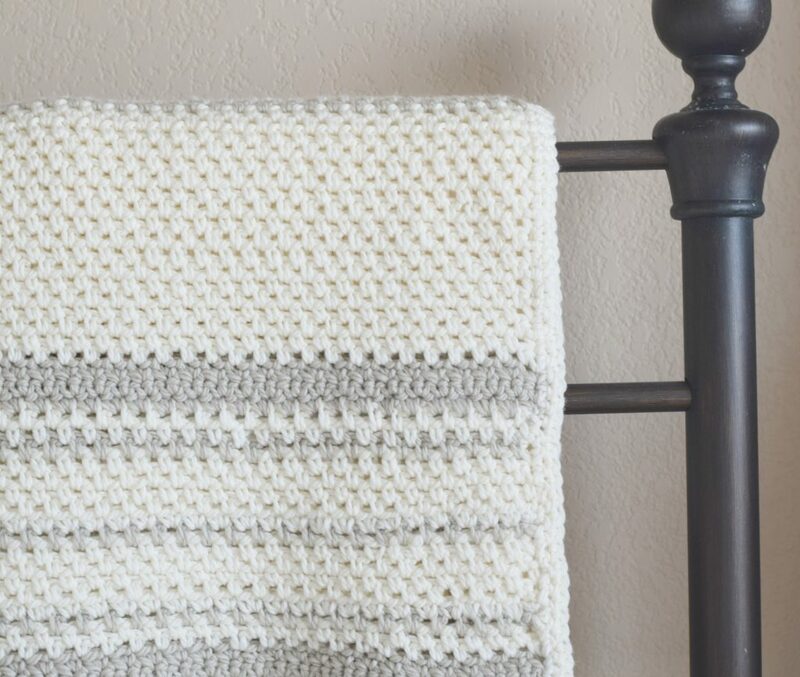 The blanket features a woven look and a color scheme that go with any home décor and simple stripes. Scroll down for the free pattern below, or you can purchase an inexpensive, advertisement free, printable PDF version from my Etsy shop HERE! This blanket uses the granite stitch. You can find several helpful YouTube videos on how to make this stitch if you’ve never done it. 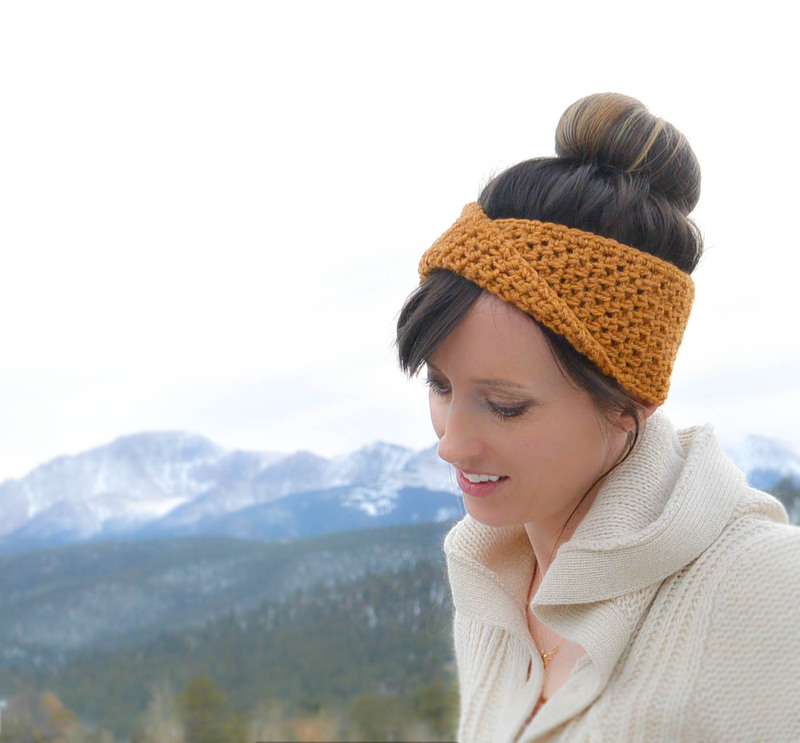 The one that I’ve linked to in the past for my Fave Slouch Hat and Twist Headband is from Fiber Flux, and you can find the tutorial HERE. You will be working single crochet stitches into the chain stitch below to create this look. Evenly single crochet around entire blanket for two rounds. Thank you to Cascade Yarns for supplying the yarn for this project! Have you made some crochet heirlooms for your family? I’d love to hear about them in the comments below! Wow! That is so beautiful. I think it will be around for a long long time! Hi Jackie! Yay! Thank you! I sure hope it sticks around for a long time. Took long enough to make!!! Ha! Lovely, Jessica! April to October is no time at all for blanket-making. 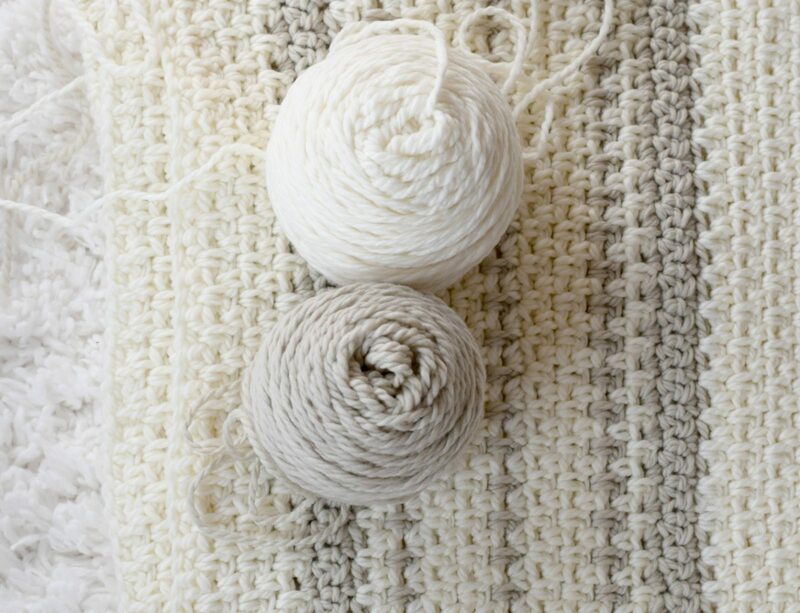 Some us take A LOT longer to finish an afghan-size blanket (and we are always envious of those speedy crocheters who whip a blanket up so quickly). Long-time crocheters call this a moss stitch, but whatever you call it, the results are the same–a beautiful heirloom blanket. Hi Judy! Very true – it is hard to make a blanket during those months. Thanks for the info about the stitch name. I will add the term “Moss Stitch” above as well. I’ve also heard it called the “Linen Stitch”, so I’m never really sure what to call it! Yes, I’m so envious of those that can whip out blankets in no time. I’m so glad that you like the blanket Judy and thanks so much for the kind words. Have a great day. The blanket is beautiful!! I am interested in making it and 2 of us have tried to work off the free pattern. We get stumped rows 2=6 then after 9. 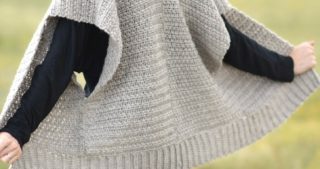 Is there a way to ask questions about the blanket pattern? I do my very best to keep up with all of the questions and comments I receive on the blog as well as Facebook and email. Occasionally comments are sent to spam or they get buried, but feel free to elaborate on what you are stumped on. I have answered several questions above regarding the pattern that may help? Let me know! Beautiful Jessica! And your first snow already? Not quite that cold in the Ozark Mountains yet… Soon I hope! I just finished a gift for a friend who had a baby. Instead of a blanket, I made a large rectangular shawl. All undyed single ply Baby Alpaca, gemstone beads, lace. I thought that it would be a good special occasion baby blanket, then they could use it as a shawl. I hope that it becomes a family heirloom someday! 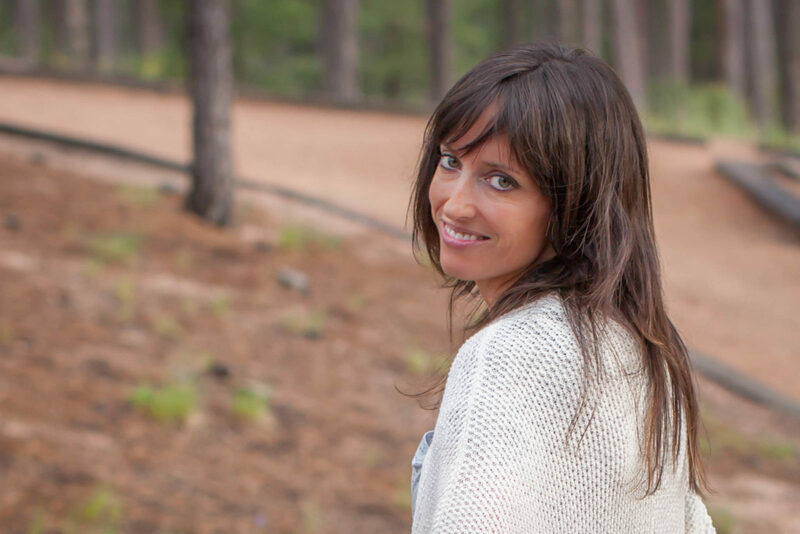 Oh wow – that shawl/blanket sounds stunning Rebecca! That’s sure to be an heirloom. I’ve never crocheted or knit with beads and am always so impressed when I see it. Thanks for sharing And it’s always fun to hear from you! 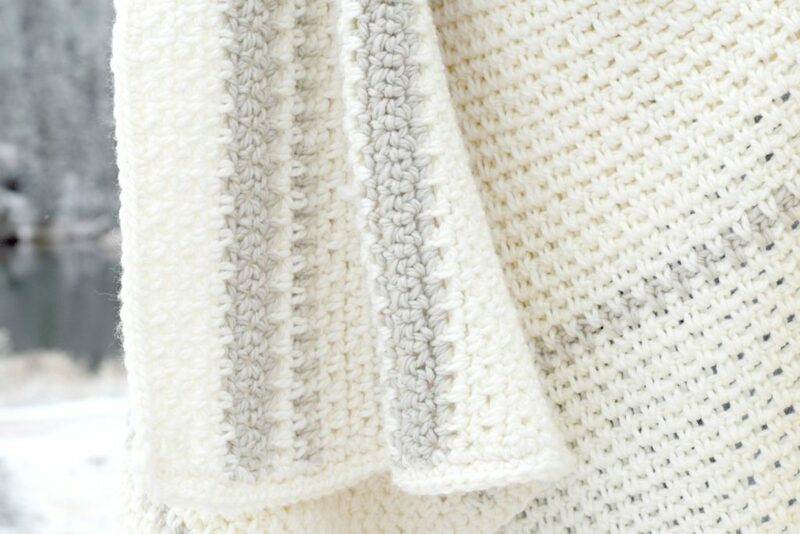 This blanket is truly beautiful & I’m sure love was in every stitch. I made 2 crocheted blankets when we lived in Florida & got so hot as they got larger. This is a beautiful heirloon & hope it will always be loved & appreciated. You did a lovely job. Hi Sandra! That means a lot to me – thanks so much. I bet you got hot making big blankets in Florida! It’s definitely an activity that is better enjoyed in cooler weather. That’s probably part of the reason it took so long for me to make this one. Have a great night Sandra! I love all your patterns & started this one today with some yarn I had ready for blanket project! I love love love this stitch & your beautiful design~ Please can you confirm the instructions are correct to repeat row 6 or should it be 7? Hi Sheeny! Thank you for catching that! I missed changing that row in my edit. Yes, you will repeat row 7 for the thick grey striping. I’ve updated it and have changed it in the pattern! What a great afghan. <3 now to go buy more yarn. this will make a great graduation gift. I’m so glad that you like it! What a sweet idea to make it as a graduation gift. Also thank you for sharing this amazing pattern!!! I’m so glad that you like it! Yes, you simply want to keep an odd number of stitches. Make the starting chain about as long as you want it wide, with an odd stitch count. I hope you enjoy it! So lovely. this design is simple and comforting. I love the neutral color choices. Thank you for sharing this charming pattern. Hi Laura! I’m so happy that you like it! Thanks so much for stopping by! This looks gorgeous! I just ordered the yarn! Hi Karen! I hope that you enjoy making it. Let me know if you have any questions! Thank you so for sharing this BEAUTIFUL pattern. I feel in love with the u used. I have a question about changing the colors. Row 7 says Sc in the 2nd ch from hook, (that lost me). Do I have to make another chain 121 and connect the two or do I just do a normal yarn color change move. I hope I’m making sense. Hi Brenda, sorry about that – just do a normal color change and make a sc in the first sc stitch. Does that help? I will change the pattern above. Yes and thank you again for sharing this beautiful pattern. Sorry for the mix up in lost my computer is acting up. I fell in love with the colors you used. I can’t wait to finish and put it cross my bed. I just moved in a new home and I’m still decorating. Awesome design. I’m so glad that you like it!! Congrats on moving into your new place. It’s so fun to decorate. Thank you so much for sharing your beautiful work and pattern. Please tell me if you mean to repeat row 1 in the following row of work: Row 105 – 122 Change to MC, repeat row (18 rows). Yes! I will add that above. Thank you for bringing that to my attention. Sometimes things get missed when transferring my pattern onto the blog in the late night hours. I just love this pattern! So much so that I’m hoping to get two done for Christmas :-). Do you have any thoughts on using worsted weight vs. bulky? I’d love to be able to use yarn currently in my stash, although I never need too much convincing to hit the yarn store. Ha. I wonder if you could hold two strands together to make it equal to the hunky yarn? Otherwise you’d have to just do some math and adjust the pattern for the smaller yarn. Obviously start with a longer chain! I hope it can work for you! Row 7 is confusing me also. Why does it say 2sc in next stitch, that would be an increase…..??? Hi! So in the pattern you skip a stitch, so these skipped stitches are made up with the second single crochet. Does that answer your question? Oh great got it now thanks! I misread and thought there was a chain also. Lovely blanket pattern! thank you for designing it. I’ve done bags with a stitch like this and didn’t know it was anything anyone had done before, having never seen anything like it. People were amazed when they found out it was crochet. I had fun. Do you mean to sc INTO the chain stitch, or around it? (I did around it.) Either way it will look lovely. This is such a beautiful blanket pattern. Thank you. I’d just like to confirm if the pattern above now reflects the changes you have talked about in the comments? I also hope you can answer my question since I’m not that skilled at crocheting. If I use a finer yarn than the one you used, the only thing that will really change is the size – correct? 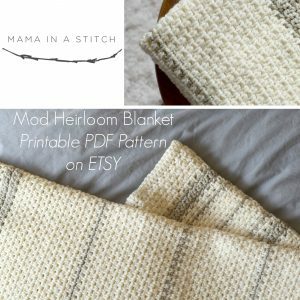 Hi Heidi – Thanks for the sweet words about the blanket pattern! Yep I’ve made corrections in the pattern above. If you use a finer yarn, your blanket will be smaller, and of course you need to use a hook size that works with your yarn. Happy crocheting! such a beautiful pattern and I love the colors. I would very much want to do it for my daughter – but she is sensitive to wool. How “wooly”/ itchy is the yarn? or is it pleasant to touch? I find it to be one of the softest wools that I have touched. Obviously, it isn’t like a super soft fleecy actrylic or cotton, but it is very soft for being wool. I bought your pattern and in the middle of making it. I got to row 49 and am confused about the color to use. I’m glad it’s going well! When you get to row 49, you will see that you repeat rows 30-48, 3 times. That includes working 18 rows of main color, and 1 row of contrast color (and you repeat that section until you get to row 105). Does that make sense? So you will change to the main color at row 106 (just corrected that because I wrote 105 for two rows!). Row 105 will be the contrast color, so you change back to to the main color. Does this help at all? I hope so! yes it helps thank you! I’m trying to make this, using a bulkier yarn. I think I need to decrease the number of starting chains to get the blanket the width I want. Is it a repeating pattern of 3 + 1? I’m trying to work it out in my head how many chains I’d need to start. Sorry I just saw this! Glad you got it! Also, are you supposed to chain one at the end of each row before you SC into the last stitch? I am going to try this stitch on a rag rug. I will see what happens. I think it will work. Just less stitches! I will send a pic if I think it is worthy . The blanket is beautiful! Amazon is out of stock of the contrasting color yarn you linked to, so I’ll have to use something else. I noticed that the main color and the contrasting color look like they are listed as the same weight. Is the contrasting color suppose to be a lighter weight yarn than the main color yarn? 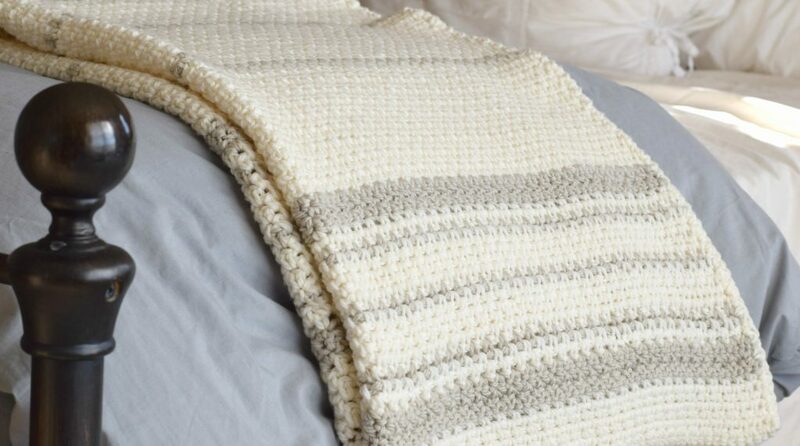 Hi what’s the approximate length and width by inches required to crochet this for a twin bed size? And that being said , about how many chain stitches across ? I’m just getting ready to start my blanket for a friends niece. So excited. Can’t wait to dig in. I made this in a lighter weight yarn for my grandson to use in the fall in his crib so it’s not too heavy…LOVE how it came out!! Want to make for my son in Florida… Again another lightweight yarn, but his bed is a king… How many stitches do you think I would need in my first chain? And how many rows for a king size bed? The way I did it was with an odd stitch count, but across the row it is worked the same way as the tutorial (making a sc into a ch space). You will just add an extra sc with my pattern to make up for that extra stitch. Hope this helps and so glad you like it! I was wondering if in row 7 I should be doing the 2 sc into the chain spaces or into the tops of the scs of row 6? Row 7…did you mean sc in the sc from the previous row, then 2 sc in the ch 1 space, skip the sc from previous row and 2 sc in ch 1. ? I just finished this blanket today. I used a Brown instead of the gray. I LOVE this blanket! Hi there! Love this pattern! I was wondering how you weaved your ends in? I’m finding it a little difficult with the type of stitch to get them securely weaved in and hidden. Any tips? Thanks! Hi Kim! It is a little tricky to do, but if you change yarn at the end of the row, that’s helpful. I actually weaved them into the stitches themselves, not into the holey mesh. 🙂 I don’t really know how to describe it other than work it into the tightest part of the fabric. If I want to make this for a twin bed blanket how many do I chain to start with? Then just add more plain rows in the middle to make it longer? Based on her pattern you should be able to just chain the length you want. So I would chain until it fit across the bed and then she says to use an odd number. Count your stitches and add one if you need to. Then off you go with the granite stitch. As for color changes, that would really be up to you. Good luck! I have a quick question, I want to make this for a couple getting married this fall, I want to make it big enough for the 2 of them to use together and cuddle up with as they watch their shows and movies. How would I go about figuring out what size to make this? How many stitches for my first row and then how many rows? Also, how would I figure out how many skeins I would need? Sorry, I have only been crocheting since late December of 2017. Thanks for your time! Hi! I love this pattern you’ve made! If I wanted to make this with Bernat blanket yarn, which is super bulky (6) weight, would I need to change anything? I’m relatively new to crochet, so thanks in advance for any advice! I’m making this pattern now with Been at blanket yarn. And I’m using the j hook. The only issue I am having is row 7. It’s making the blanket ruffle and not stay straight. I have to pull and smooth out my stitches so they lay flat. Sorry to hear that Jenn…..have you tried counting your stitches in each row? It sounds like there could be some extra stitches being added. Can anyone help me with a good place (or places) to add rows to increase the length, but keep the integrity of the pattern? It would be greatly appreciated! Thanks in advance! 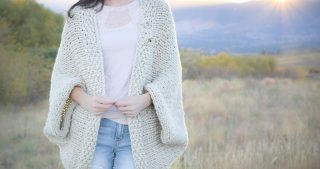 I absolutelyl ove this pattern but I am having a hard time finding the yarn. I have found it for a reasonable price but most places are out of stock. The yarn on Amazon is twice as expensive! Any ideas on other yarns to use to get the same look? Honestly, any chunky weight yarn that you like will work for this pattern. I love the Cascade that I used here, even in other colors if you can find it! I do find it more difficult to find chunky weight yarns though which is unfortunate because I love to use them. Eeeep! I love this blanket! Can’t wait to make it. Thank you for sharing the pattern. My first (completed) crochet project was a granny square afghan. I love it and consider it anheirloom because well, it’s granny squares after all!! Hi quick question..the video link you mention for reference to learn the granite stitch (linen stitch) says to start with an even stitch count. However your pattern begins with an odd count. Beautiful blanket by the way! Hi Connie! That’s correct. Mine has an extra stitch in the pattern, so it’s slightly different but the stitch pattern is worked exactly the same. So glad you like the blanket! I love this pattern and will be making several blankets for various family members. I have been following the instructions to the letter and have ended up with an even stitch count shortly after starting. I cannot figure out how your uneven stitch count works. Only the even stitch count is making sense to me and I am half done with my first blanket. I hope when I get to the last section of the blanket I am not 1 stitch short to finish the pattern. There is an extra single crochet stitch in each row and that’s what makes it work with the odd stitch count. Does that make sense? Maybe practice on a small swatch to see it with an odd stitch count, then move onto the blanket? Love making but i too have question concerning Row7. I sc in the first st as instructed then skipped a st and placed 2 sc in the next St. I continued across but ended up 1 st short. Am I missing something in the instruction? Thank you so much for sharing this pattern. I love the colors and how modern it looks, not granny-ish at all. I made an afghan for my son. He and his girlfriend love it. It goes so well with their living room. I made it large enough for them to both cuddle under it (51″ x 68″. I chained 151 stitches to start and added two more of the middle sections.) They use it all the time. Thanks again! Hi! I love this blanket, but I’m a knitter. Do you happen to know what stitches I would use to get the same effect? Hi! 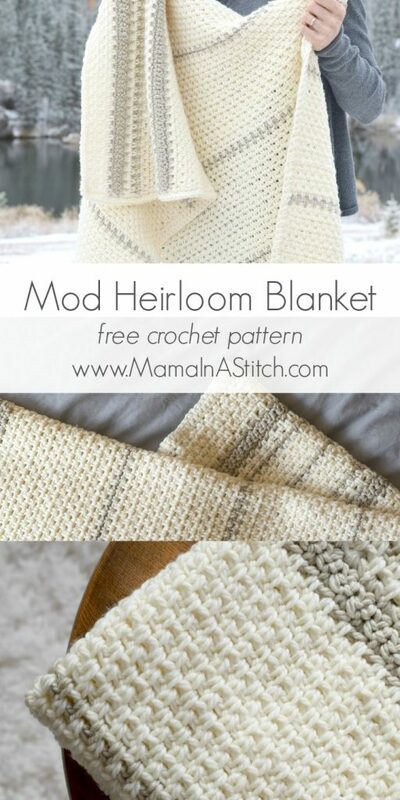 I believe the linen stitch looks very similar! I was wondering if you had a pattern for a smaller blanket? Like a baby blanket. I want to use this pattern for my nieces baby blanket. It’s so gorgeous! I love this pattern and I got the supplies to make it! But your pattern says chain 121, but the video you linked to says to chain an even number to start. Can you clarify this for me? That’s true! With my pattern you will have an extra single crochet stitch at the end of the row which the video does not. Hi, I love the look of this blanket! I’m in the UK, and am having trouble choosing a yarn size for this that is comparable to to the one you’ve used. Would it be 8ply/12ply? Or thicker? And do you know what UK size hook I should use for this? I have just begun working this pattern. On row 7-9, do I still sc into the chain spaces or into the stitches? Thank you. 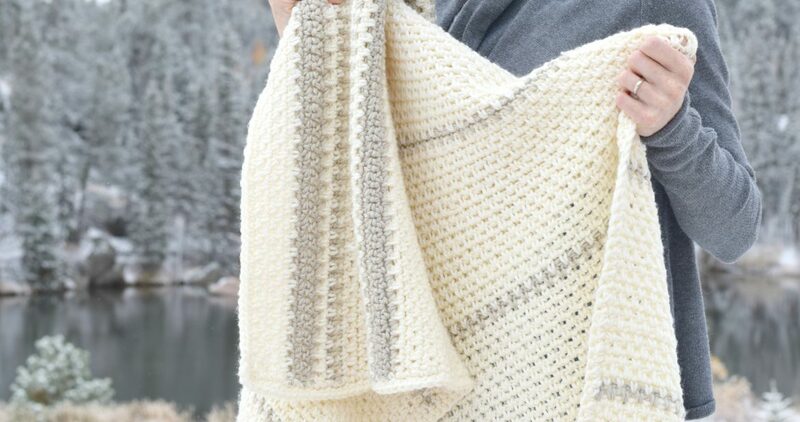 I’m interested in making this blanket for my mother as a gift, and was wondering if I could use the Bernat Blanket Yarn (weight 6) in place of the Cascade yarn with the J sized crochet hook. I’ve only ever made two blankets and there weren’t this complex. Hi, I love the look of this blanket! So beautiful! I am making this for my Granddaughter for Christmas!! Just one question – In row 7 after you sc in 2nd stitch from the hook it says sk st, 2 sc in next stitch. Repeat from*across. So I should 2 sc the rest of the row then sc the last stitch . Ch1, turn??? Then repeat the same for rows 8 and 9? I fell in love with this afghan after row 4, when I could really see the granite stitch pattern develop & ordered the paid PDF pattern as I knew I would making this afghan again. Thank you, Jessica, for such a gorgeous pattern & blend of colors & stitches. I needed more durability since this afghan will be used often (and with dogs;-) and chose to use a 75% acrylic/25% wool blend (Encore Chunky by Plymouth Yarn). I’m only on row 16 but LOVE how this is working up. I’ve increased the size for a 50″ x 65″ afghan for my daughter-in-law’s Christmas gift. She’ll love it! Hello, I’m not very well at patterns, but I’m confused on a certain section. So your blanket is primarily white but in rows 49-105 you say change to MC, then in rows 106-123 change to MC? Please help! I keep messing up my stitch count.. I chained 121 stitches to start but after that my rows’ stitch count is 120. I’ve started over several times trying to figure out how to keep the odd number. Should each row have the 121 stitches or is it correct that I lose one when I turn and complete the first row so then it should remain at 120? Also, the 1st row says to sc into the 2nd chain from the hook, then, row 2 says to repeat row 1 but then says to sc in to the 1st chain. I’m confused if I am to always sc in to the 1st or 2nd each time it says to repeat row 1. Love this pattern, yarn and the colors. Thanks. Hi Jean – yes, you lose a stitch when you single crochet across the chain. This is why the stitch count decreases. I suggest practicing the stitch pattern on a small swatch first (chain 11 for example) then moving onto the blanket when you have it down! Hope this might help! Hi. 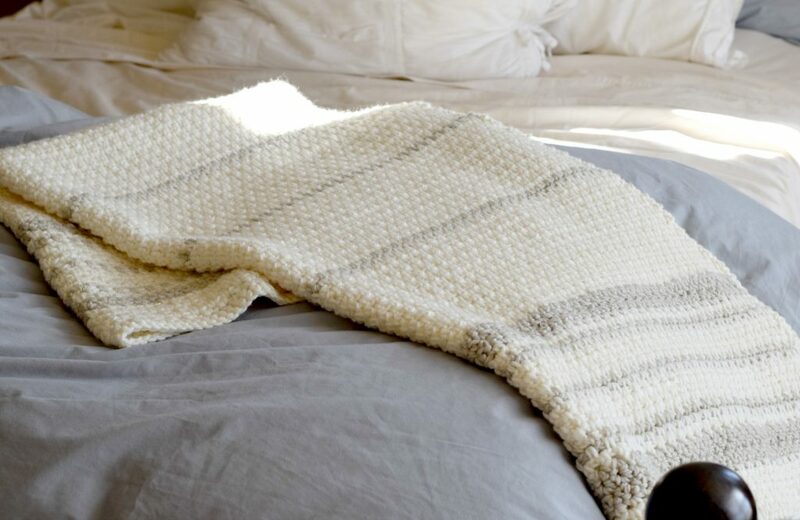 I have only been crocheting for a couple of years and I want so much to do this blanket. I have purchased the yarn this calls for but I want to make it bigger than these instructions. More like the one in the picture. It looks like a queen maybe. How much extra yarn would I need to do this size? I am wondering about rows 30 – 47 and if I am reading it correctly. From the picture, it looks like we are supposed to follow Row 1 directions for row 30 and then row 2 directions for rows 31 – 47. What am I missing?